Throughout the history of Federal Reserve operations in financial markets, our approach to engaging with counterparties has been designed to serve the effective implementation of monetary policy. The New York Fed, through its Open Market Desk (the Desk), is in the business of implementing policy as directed by the Federal Open Market Committee (FOMC, or the Committee), and the Desk has demonstrated a willingness to engage with a wide range of counterparties to achieve this objective under the guidance of the Committee. In addition to its role in the implementation of monetary policy, the New York Fed has a number of responsibilities and duties as the fiscal agent for the U.S. Treasury. We have therefore also used our counterparty relationships to assist the activities we undertake in support of the Treasury. Indeed, for decades, the primary dealers have played a critical role not only in open market operations, but also in the underwriting and distribution of newly issued Treasury securities. In addition to carrying out these domestic operations, we stand ready to conduct a number of foreign exchange operations.2 Foreign exchange counterparties are essential to the successful implementation of U.S. foreign exchange policy operations, which are conducted by the Desk but directed and funded generally equally by the Fed and the Treasury. Similarly, the Desk’s foreign reserve management counterparties facilitate operations that are investments of the Fed’s and also the Treasury’s foreign currency reserves. Two other considerations underlie the counterparty framework and support the effective execution of open market operations and primary issuance of Treasury securities. First, the Desk has long recognized the importance of transacting with established, regulated market participants that are capable of settling trades and financing long and short positions reliably and on a consistent basis in a range of market conditions. Our counterparty framework must be of an appropriate size to provide adequate execution capacity and competitive pricing. Second, the execution of domestic open market operations and primary issuance of Treasuries is facilitated by a liquid, smoothly functioning secondary market for Treasury securities. The Federal Reserve’s abiding interest in promoting the integrity and efficiency of the secondary market has motivated our recent efforts to join other agencies in analyzing the events of October 15, 2014, and to understand the implications of the evolution of Treasury market structure and the increasing incidence of electronic and automated trading. The Treasury Market Practices Group (TMPG), a private sector group of market professionals sponsored by the New York Fed, has played an important role in these efforts. Building on analysis that started before October 15, 2014, the TMPG released earlier this year an updated set of best practice recommendations and a companion white paper discussing automated trading.3 As is typical of TMPG initiatives, the group’s work on automated trading was undertaken to support market liquidity amid these changes in the market ecosystem. Much work remains to calibrate an appropriate response to changes in market structure, and last month’s conference “The Evolving Structure of the U.S. Treasury Market” provided a valuable opportunity for the official and private sectors to engage in a healthy and open debate on a range of related topics.4 The conference, organized by the Treasury, the Federal Reserve Board, the New York Fed, the Securities and Exchange Commission, and the Commodity Futures Trading Commission, featured a review of the agencies’ July 2015 Joint Staff Report and highlighted a number of key issues, including the adequacy of the Treasury market data currently available to the public and to the official sector, the impact of the current regulatory environment on liquidity, and some potential operational risks posed by shifting market structure and trading behavior.5 The Treasury made clear at the conference that work in this area is ongoing when it disclosed plans for the agencies to issue in the near future a request for information on the next steps outlined in the Joint Staff Report. The Joint Staff Report presented data showing that primary dealers now account for less than half of trading volumes in the interdealer broker market, but it is important to remember that this is only a portion of the secondary market for Treasuries. 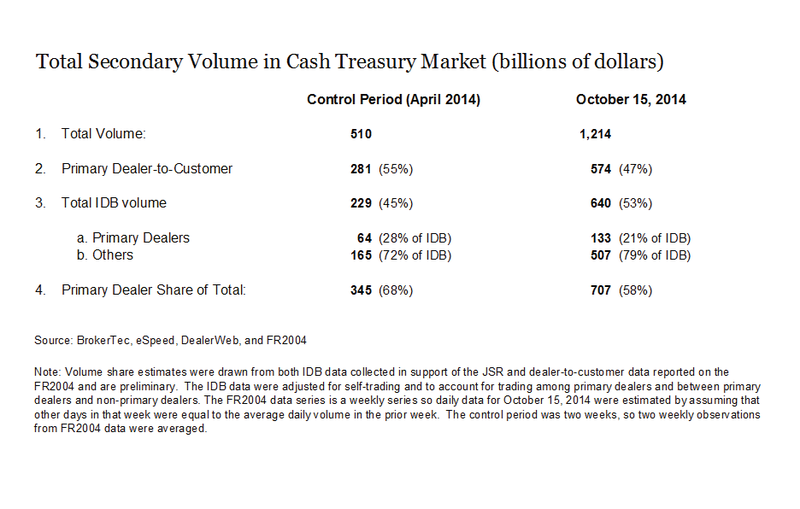 As a forthcoming Liberty Street Economics blog post will show, when these data on the interdealer broker market are combined with the dealer-to-customer market data from the New York Fed’s Primary Dealer Statistics, we can see that primary dealers accounted for roughly two-thirds of overall Treasury market secondary trading volume in April 2014, and about 60 percent on the day of October 15, 2014.6 (see the table) So while the primary dealer share of daily interdealer broker volume has fallen below 50 percent, primary dealers still account for the majority of aggregate secondary market trading activity, owing to their important role in the dealer-to-customer market. One final consideration that bears mention is the concept of an imprimatur that some market participants associate with status as a New York Fed counterparty. Despite this long-standing perception among some market participants that primary dealer status represents an endorsement by the New York Fed of a financial institution’s creditworthiness or ability to provide efficient execution of large transactions, we have repeatedly stressed the importance of other market participants’ engaging in their own assessment of potential counterparties’ capabilities. Recent history provides several reminders that the primary dealer designation provides no guarantee against credit risk or other counterparty risks. While the New York Fed certainly performs its own due diligence, we do so in pursuit of our unique business objectives, which may differ from those of private agents. Market participants should therefore be engaging in the appropriate level of due diligence required by their fiduciary responsibilities in the context of their specific business requirements. Such independent assessments are in our collective interest because they foster market discipline and a safer, more secure financial system. Looking back over the first century of the Fed’s history, we can see how our counterparty relationships have adapted over time in response to changing operational needs and the evolution of financial markets to create a system that is unique among the world’s leading central banks. Open market operations were first established by the Federal Reserve as a tool to control U.S. monetary conditions in 1922, in response to uncoordinated purchases of Treasury securities by different Reserve Banks interested in acquiring earning assets. The Banks formed an “Open Market Investment Committee” to coordinate their activities, and the Committee soon began to make policy recommendations to increase or reduce the availability of reserves to member banks. The Banking Act of 1935 created the modern Federal Open Market Committee, and the Committee selected the Federal Reserve Bank of New York as its operating agent.9 The Federal Reserve Act specifies the types of transactions that Reserve Banks can undertake, but does not designate how they should be undertaken. Although other possibilities exist, such as public auctions and reverse auctions, for more than 80 years the Desk has conducted monetary policy operations with bank and nonbank dealers, primarily because they were the core market makers—that is, liquidity providers—for Treasury securities. Relative to domestic open market operations and auctions for primary Treasury issuance, foreign market operations undertaken with private counterparties to further foreign exchange policy and the investment of foreign reserves are relatively small and infrequent and have a somewhat shorter history. The Fed first undertook very limited foreign exchange (sterling) purchases in the market during the late 1920s and early 1930s in an effort to defend the gold standard.12 The Gold Reserve Act of 1934 established the U.S. Treasury’s Exchange Stabilization Fund (ESF) to undertake such operations, but the ESF did not exercise its authority very often until the Bretton Woods fixed-exchange-rate regime came under pressure in the 1960s. In 1962, the Fed began to undertake foreign exchange operations in cooperation with the ESF, and the Desk acted as agent for both accounts. In those early years, the Fed and the Treasury focused on conducting swap operations with foreign central banks, although some direct intervention with the private-market participants did take place. In 1973, after the collapse of Bretton Woods, the dollar began to float, and foreign exchange operations entered a new phase. Over the next two decades, interventions in the private foreign exchange market became much more frequent and on some occasions quite large. Since the 1990s, foreign exchange intervention has become less frequent. The history of foreign reserves investment operations in the market is even shorter; the Desk began to transact directly with market participants to invest foreign reserves held in the System Open Market Account and ESF foreign reserves only in the mid-1990s. Before that, the U.S. monetary authorities held all foreign currency reserves in the form of deposits at other central banks. Comparing the Federal Reserve’s counterparty framework with those of our foreign central banking peers highlights a number of differences. To begin with, the Federal Reserve is among the most transparent of central banks in disclosing the specifics of its market operations, including the data reported under the requirements of the Dodd-Frank Act. Details about foreign exchange transactions and foreign exchange investment operations are reported in the quarterly foreign exchange reports released to the public by the New York Fed. In addition, summary information about all operations appears on the weekly Federal Reserve balance sheet, which is available on the Board’s website. The Desk posts comprehensive results of all domestic open market operations with primary dealers and expanded counterparties to the New York Fed’s public website within a few minutes of the operations’ completion. Results of Treasury auctions are likewise released to the public within a few minutes of the close of competitive bidding and contain considerable detail regarding participation by primary dealers and both direct and indirect bidders. Such reporting by the Treasury exhibits a high level of transparency relative to foreign treasuries’ reporting. In most foreign jurisdictions, the central bank or monetary authority has the ability to conduct open market operations with a large number of banks that make markets in government securities and also have reserve accounts with the central bank, while the national treasury separately manages relationships with financial institutions to underwrite and distribute its debt issuance; these latter entities are termed “primary dealers” and are often the only entities having access to primary market auctions. In the United States, by contrast, a comparatively smaller number of firms simultaneously act as counterparties for the central bank’s domestic open market operations and as backstop underwriters and distributors for Treasury debt issuance; firms designated as “primary dealers” are required to act in both capacities. In fact, the United States is somewhat unique in that (i) being a “primary dealer” means that the firm is a counterparty for central bank monetary policy operations and has certain obligations with respect to primary national debt issuance and (ii) management of the primary dealer system resides with the central bank rather than the national treasury. This unique structure is a legacy of history. Beginning in World War I, the Treasury offered coupon-bearing securities on a fixed-price basis. Small banks and securities brokers commonly subscribed for their own and customers’ accounts, and there was little need for any formal or informal underwriting process. Market making in outstanding Treasury securities, however, was a capital-intensive process conducted mostly by nonbank dealers, though a few banks did have significant dealer operations. These dealers maintained the liquid secondary market for Treasuries and served as counterparties for open market operations. This state of affairs continued until 1970, when the Treasury introduced auction offerings of coupon-bearing debt. Auction participation, like market making, was a risky, capital-intensive activity, and dealers—especially primary dealers—began to play an increasingly important role in the primary market. Though the transition was gradual, this period represented the moment in history when the same set of counterparties began to participate in both open market operations and the primary issuance of Treasury securities. More recently, the Federal Reserve’s approach to designing an effective counterparty framework has been informed by our experience of conducting asset purchases as well as other balance sheet actions and exercises necessary to implement policy in the post-crisis period. In these years, we have ventured beyond the primary dealers to conduct open market operations with a wider and more diverse range of market participants. The introduction of daily reverse repurchase agreement (RRP) test operations in September 2013 required several years of work by the Desk to establish relationships with an expanded set of counterparties beyond the primary dealers or entity types that are currently eligible to be primary dealers, and to develop an approach to evaluating the capabilities of these firms that is distinct from the process for assessing primary dealers. This expansion is a requirement of our business needs given the current size of our balance sheet, specifically the need to maintain appropriate control of short-term interest rates with abundant excess reserves in the banking system.13 Primary dealers, and entities of the type that are currently eligible to be primary dealers, which typically exhibit structural demand for cash financing to support inventories, are unlikely to satisfy this requirement. To the extent that the ongoing evolution of the structure of the Treasury market, including technological advancements and changing investor behavior, affects the role of primary dealers as market makers, it is important to analyze the implications for the Fed’s ability to meet its objectives. The primary dealer system has proven to be very effective for both the conduct of monetary policy and the issuance of Treasury debt. I am very confident that the existing counterparty framework—continuing to utilize primary dealers for traditional domestic policy open market operations, expanding to new counterparty types, as appropriate, for targeted operations to increase the effectiveness of domestic policy implementation, and maintaining relationships with a sufficient number of large market participants in the relevant foreign exchange markets for possible foreign exchange policy and investment operations—provides enormous capacity to implement a wide range of monetary policies. Moreover, we have demonstrated a commitment throughout our history to make any adjustments necessary to ensure a robust and effective operational framework. Toward that end, the Desk presented at the June 2015 FOMC meeting an update on a review of the counterparty framework, and indicated that we anticipate regular reviews of the counterparty framework roughly every three years in the future.14 We look forward to working with our official and private sector partners represented in this room as we pursue these goals. 1 I would like to thank Stephen Douglass, Frank Keane, and Susan McLaughlin for their excellent assistance in the preparation of these remarks and colleagues in the Federal Reserve System for numerous insightful comments and suggestions. 2 Counterparties also facilitate the Desk’s provision of services to foreign central banks, governments and international official institutions. Additional detail on these services can be found on this website. 3 The best practice guidance and white paper on automated trading are available on the TMPG homepage. 4 Additional information about the conference is available here. 5 The Joint Staff Report is available here. 6 The forthcoming blog post will be published on the Liberty Street Economics website. 7 Since July 2013, the Desk has conducted pilot programs with seven smaller firms outside of the primary dealer system in order to explore how to conduct open market operations in Treasury and mortgage markets with firms that are considerably smaller than existing primary dealers. The Treasury Operations Counterparty (TOC) and Mortgage Operations Counterparty (MOC) pilot programs have provided valuable insight into the appropriate size and operational capacity of open market operation counterparties. 8 Kenneth Garbade, The Early Years of the Primary Dealer System (New York: Federal Reserve Bank of New York, 2015). 9 In fact, the FOMC directs a “Selected Reserve Bank” to conduct open market operations. Since the centralization of open market operations in a single Reserve Bank in 1935, the Federal Reserve Bank of New York has always been designated as the Selected Bank, owing in part to New York City’s historical importance to U.S. financial markets. 11 Primary dealers are expected to bid in every auction for, at a minimum, an amount of securities representing their pro rata share of the offered amount. That share, currently 1/22nd, is based on the number of primary dealers at the time of the auction. 12 Stephen V. O. Clarke, Central Bank Cooperation 1924-31 (New York: Federal Reserve Bank of New York, 1967), pp. 162, 175-76, 205, and 209. 13 For more on policy normalization, see these three earlier speeches: “Interest Rate Control during Normalization,” “Money Markets and Monetary Policy Implementation” and “"Implementation of Open Market Operations in a Time of Transition." 14 See the minutes from the FOMC meeting of June 16-17, 2015.